4. Apply grit - Grit Grade Mixed 1 - 3mm - at 2.5kgs per square metre. Typical road plate - 8' x 4' - 1.83m x 1.22m = 2.23 square metres, allow 2.5 litres of resin and 6kgs of mixed grit. Epoxy Seal Coat is supplied in the Ramp and Road Plate Kits at 2.5 litres per 8' x 4' plate, (2.23 square metres), but it can be purchased separately in 1 litre, 2.5 litre and 5 litre packs. 1. Strip any existing loose grit with a wire brush or angle grinder, grit blast or needle gun. 3. Strip the bare surface or bald spots to clean bare metal. 4. Clean with our Epoxy Cleaner 250cc to ensure that no oil or grease remains in the metal. 5. Regrind if necessary to eliminate any solvent cleaner smear film. Wipe over with a clean White Cloth. 6. Wipe thoroughly again with the White Cloth - if any dark marks appear on the White Cloth repeat steps 4 - 6 until the cloth remains perfectly white - this is the secret of success - any dirt left on, no matter how little, with reduce the resin bond and lead to bald patches, where the resin has fallen off. 6. Lay clean cardboard or plastic sheeting around the edges of the plate to catch aggregate (grit) that falls off during coating, for re-use. 7. In the Winter, or for cold conditions, heat the metal with dry heat - use electrical heaters with fans. Avoid gas heating (particularly Propane), because of the water produced, which can cause condensation on the steel and loss of adhesion. Maintain background heat until the resin is completely hard. This may take up to 2 days during cold weather. Lack of heat may also allow condensation to form on the resin and the aggregate (grit) may then fail to bond properly. 8. Apply Epoxy Seal Coat Clear with a smooth plastic spreader, roller, squeegee or brush, to a depth of 1mm. 9. 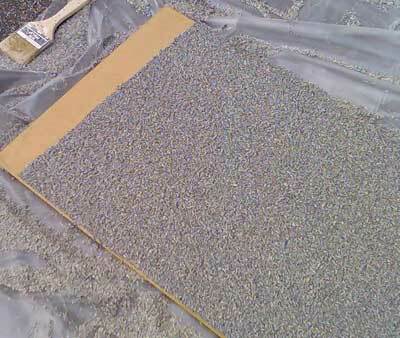 Apply clean, dust free Aggregate (grit) to the adhesive so that cover is complete, with some excess. Pat the aggregate (grit) into the resin very firmly with a clean wooden or metal object (plastering float, batten, cricket bat), or use a piece of clean hard plastic material. It is not necessary to apply another coat of resin, as long as the first coat is thick enough and the aggregate (grit) is fully bedded in. 10. Leave to cure for at least 24 hours, subject to temperatures being above 15 degrees C at all times. Maintain the heating for the whole period. In cold weather you must keep the metal surfaces above 5 degrees C. Below 5 degrees the resin curing will slow and curing will be delayed. On cold, damp days condensation on the surfaces or on the resin can reduce resin and grit adhesion, so screen off the area to prevent draughts and warm up with heaters overnight. In Winter adjust the resin temperature by placing the pots of resin in warm water. For cleaning, use our Epoxy Cleaner, 250cc, cellulose thinners, epoxy thinners, or trichlorethylene. The ramp or plate MUST NOT BE USED until the coating is really hard. Make a test piece (of metal or wood) when the resin coating is complete. Coat the test piece with resin, without grit, and leave next to the gritted area. Test by first thumb pressure and then with a screwdriver before using the roller. When hard, the coating still continues to gain strength over several days. Resin comes off the metal - not clean enough, too cold when coated, condensation on the metal when coated, resin not fully cured. Grit comes off the resin - condensation on the resin when gritted, grit too dusty, wet grit, grit not tamped into the resin when applied, resin not fully cured. 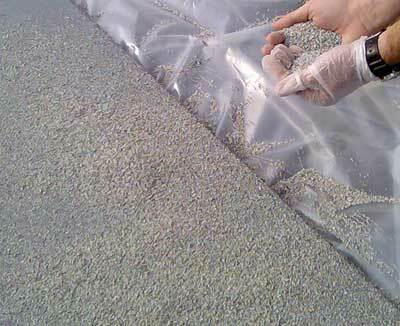 Resin remains sticky - not mixed fully, too cold (resin stops curing at 5C), too damp, condensation on resin before or after gritting due to low temperature, or through using bottled gas heating. Prime quality fused Alumac produced from stringently controlled raw materials form the most durable grit surfaces for Brake Rollers. Grade 12, 2mm - 3mm, or Grade 16, 1mm - 2mm, or Mixed Grade 1mm - 3mm. Grit to excess and collect for re-use. When dry brush off excess grit. Call us 01626 331351 for calculation of your Ramp, Gangway, Walkway, Road Plate, Potato Peeler or Brake Roller cleaning and finishing needs. Discuss the Grades of Grit available to ensure satisfaction.